Welcome to World of Games! 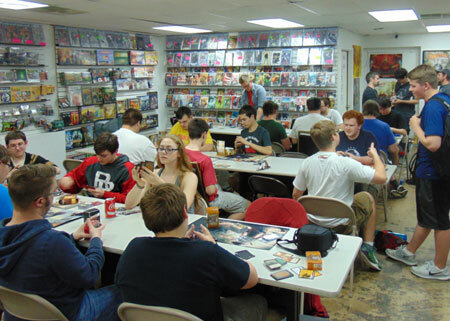 World of Games is a Local Game Store located in Lakeville Minnesota that offers Vintage Video Games, Comic Books, Trading Cards, Tasty Peach, and many relating accessories. We are proud of our female-friendly atmosphere, great customer service, and lower prices than most Local Game Stores. World of Games was founded in 2006 by Phil Bieber. They proudly served the Vintage Video Games, Computing and Collectible needs of Lakeville and the surrounding areas. In 2009, they expanded their services and products to include Comic Books, Collectible Figures, and traditional/role playing/trading card games. Two years later, Magic: the Gathering and Dungeons & Dragons events were added to their calendar. As of March 2017, Amy and Jason Baker purchased the store, in honor of Amy's brother, from Phil and changed the name to World of Games 2.0. They want to maintain the high quality customer service and low prices that World of Games has always been known for. They strive for World of Games 2.0 to have a female-friendly atmosphere as well as being a welcoming and friendly place for people of all ages and backgrounds. World of Games 2.0 offers a variety of events and products for the tabletop and video gaming community. Whether you come to Friday Night Magic or have a disc that needs to be repaired. Stop by our shop located in Lakeville Minnesota on Holoyoke avenue for all your Vintage Video Games, Trading Cards, Comic Books, Tasty Peach, and Tabletop Game needs.